UCLA_LGBT is one of more than 5,000 organizations on LibraryThing. The UCLA Lesbian Gay Bisexual Transgender Campus Resource Center envisions lesbian, gay, bisexual, transgender, intersex, queer, questioning, and same-gender-loving people and our allies as fully included and affirmed in every aspect of the UCLA community where justice, equality and respect for all prevail. The UCLA Lesbian Gay Bisexual Transgender Campus Resource Center provides a comprehensive range of education, information and advocacy services and works to create and maintain an open, safe and inclusive environment for lesbian, gay, bisexual, intersex, transgender, queer, questioning, and same-gender-loving students, faculty, and staff, their families and friends, and the entire campus community. About my libraryThis collection is in the process of being updated and will be periodically updated as the collection continually grows. Please contact us with any questions or concerns about any specific material. 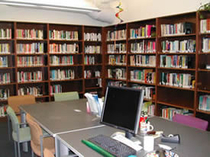 The UCLA LGBT Center Library is home to over 4000 books, films/DVDs, and journals. With a generous grant from the Liberty Hill Foundation, Candace Lewis was hired in 2004 as a graduate level librarian, to catalogue the library and prepare it for use. Since then, Candace has encouraged the UCLA School of Information Science to establish the LGBT Library as a training site for other graduate level Information Science students who have made the Library accessible via our website. Members of Library and Archive OUTreach, the LGBT graduate student group within UCLA's School of Library and Information Science, are now official managers of the LGBT Library.